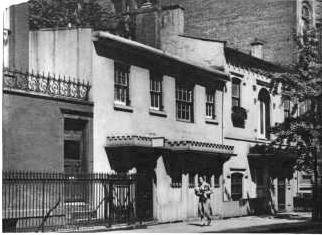 When the wealthy James Couper Lord, a dealer in iron, purchased Charles Moran’s Gramercy Park home in 1855 the rear lot facing 19th Street was still a grassy plot. It would remain so for another six years before Lord had a two story carriage house constructed in 1861. If James C. Lord used his stable for anything other than just that is unsure; however before the turn of the century it had been converted to the studio of stained glass craftsman Craig F. R. Drake. Just when the stable took on its charming Gothic Revival costume is undocumented. The picturesque, protruding entrance formed a crenellated balcony for the second story arched double doors. Flat-headed Gothic eyebrows floated oddly above shallow-arched windows and a Gothic scallop was affixed below the modest cornice. Drake would stay on in the little building for several years; an advertisement in the April 20, 1901 issue of The Churchman listed him as a “glass stainer” of memorial windows. Craig was, according to The New York Times, responsible for the leaded, diamond pattern windows. In 1903 author and artist F. Berkeley Smith leased the building and had architect August Pauli design interior renovations, creating residential space. Although Smith most likely spent more time traveling than at home (he wrote and illustrated numerous books about foreign cities), he created a comfortable two-bedroom home outfitted with wood paneling and fireplaces. That same year The New York Times complimented the little house at No. 129 East 19th Street as having the most “picturesque exterior” in all of New York. By 1909 the building was the office of architect Herbert Lucas and construction engineer Colonel Eugene Willett Van Court Lucas. But it would be a residence again before long. 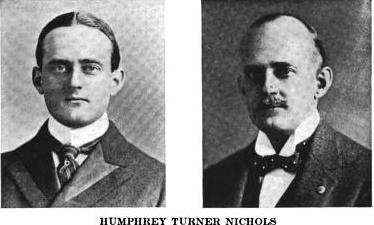 By 1922 Nichols had moved his office to No. 45 East 17th Street and made East 19th Street his home. When he was not writing or at the Players Club, he was a member of the Union, Harvard, New York and Tennis & Racquet Clubs. Four years later Humphrey and Edith Nichols moved to Boston. The pretty little house would see a quick succession of tenants. In 1931 the widow of Aldo R. Balsam, Margaret Nash Balsam, leased the house. Two years later it was the scene of resident William Henry Hamilton’s wedding to Anne Kirkpatrick. Hamilton was a member of the Council of New York University and the president of the Travelers Aid Society. Like Nichols, he was a clubman, having memberships in the University Club, Turf and Field Club, Piping Rock Club, and City Midday and Riding Clubs. Dr. Marvin B. Day leased the house in October of 1941 and exactly two years later it was taken by Dr. Clara Day—the two doctors were assumedly somehow related. Richard Dudensing, III and his wife, June, were living here in October 1949 when their daughter Judy was born. Both the father and mother came from well-established New York families. Four years later the owner, Mrs. Gertrude H. Calfee, sold the house to Florence R. Frost. By this time a third story had been added. It was assessed at the time for $45,000. The charming little storybook home survived throughout the 20th century catching the eye of tourist and New Yorker alike. When the house sold again in 1992 a restoration of sorts was executed with the input of the Landmarks Preservation Commission. Because there seems to be no documentation on the original renovations and how the little carriage house became a Gothic gingerbread house, its architectural history is somewhat mysterious. But none of that detracts from the end product: a delightful and surprising little house. When does the red brickwork date from? It's not visible in the photo from 1938 and the brickwork is in immaculate condition. It looks like new. To clarify, my question concerns the brickwork on the neighboring building. "Today No. 129's next door neighbor has a near-matching entrance, making an especially pleasing combination -- photo by Alice Lum"
it is hard to discern in the vintage photo; however it appears that the neighboring building was stuccoed. In the renovation it was either sand-blasted or the stucco removed (if indeed that is what it is). Repointing of the brick and cleaning would make it appear new.